The Whitecross Hall still existed when Google did the photography for Street View in May 2015. You can view it here. 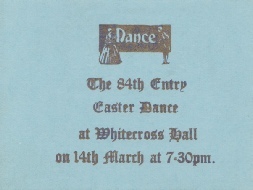 The name ‘Whitecross Hall’ is just readable towards the apex of the building. 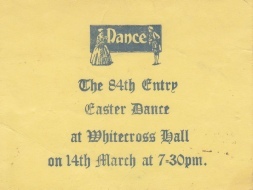 "The entry organised this night out in a hall in the south end of Weston, where exactly I cannot remember, but I should think that the hall is still there. The manager took some convincing that a bunch of teenage service youths could be trusted with his hall. Most of the organisation was carried out without the powers-that-be being involved until the very end, that last challenge was getting the buffet from the NAAFI to the hall. Ron McConkie and I made a plea to Chunky Davies to shift it in his car! This he did with discretion. We organised a bus to bring nurses down from Bristol and Roy O'Connell saw off some local youths who fancied their chances at gate crashing our party. There must be someone else who remembers this. 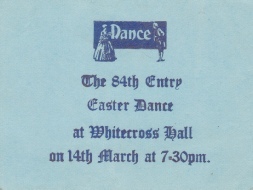 Were the tickets produced by someone in the printing guild? There must have been a band as well. Somewhere in the depths of the detritus that I seem to have gathered over the years is a note book with the names of all who attended along with the price charged, must find that book as I am sure there are other pieces of info in it." Harvey found the list in October 2013 and donated it to the 84th Entry archives. Hover over the image below to see a larger version.